Soon after we started this food group, we learned that Eugene had friends of many different nationalities. We don’t really know why or how he happened to befriend so many from other lands, but he made it clear that he had them. At our dinners he would often refer to a friend from India, or China, or Peru, to name just a few. Eugene would then pick the brain of that friend asking for a recommendation; a place where we could find an authentic replication of the food of that person’s particular homeland. For his first pick, Eugene called on a Russian friend who suggested Café Glechik. Below is what we experienced on a warm summer’s night in 2002. There was a slight delay in getting started on the trek to Brighton Beach, to the Ukrainian restaurant suggested by Eugene called Café Glechik. The delay was due to the sudden emergence of cockroaches and other less unsightly bugs in my kitchen. I needed expert help and there was no one else to call than Zio. For those not aware of it, Zio is a man of many talents. Not only can he make a first rate beef braciole, he is also a talented illustrator. But it is his ability to kill termites, cockroaches, carpenter ants, the many variations of rodents, and all those other pests that is his true gift. I needed that gift and Zio delivered with a few well-placed shots of an extremely deadly, though not odorous concoction that the cockroaches, he claimed, just cannot resist. The other problem was the little bugs I had been seeing on the kitchen counter. We spent time shaking a few items in my cupboards seeking the source of these bugs, but were having no luck until we found a few lounging in a box of Festival mix I had brought back from Jamaica. Festival being the equivalent of fried dough and served usually with jerk pork and chicken. The bug Zio identified as a flour beetle. The Festival had to go. With it, I hoped also would go the flour beetles. Finally we headed out, with Charlie in tow. Over the Triboro Bridge. Crawling through the BQE. Heading down Ocean Parkway. Finally, Coney Island was in sight and after an hour of driving, we made it to Café Glechik in the Russian/Ukrainian enclave of Brighton Beach. The others were seated and waiting in the small, busy café when we arrived. The Café did not have a liquor license and Gerry had gone out in search of vodka. He was told there was a liquor store on a street called “Brighton 10.” He returned empty-handed. “Too many Brighton 10s,” he said shaking his head. Apparently there was more than one. In the meantime, a young man called Vlad began to explain the items on the menu. He was helpful and patient though inexperienced. After a few really tough questions such as what would he suggest we eat to sample a true Russian meal at Café Glechik, he gave up and handed us over to another waiter, this one not as patient, nor as helpful. He wouldn’t even tell us his name he just wanted our orders—we were on our own here. After my contact lenses cleared from glancing at the Russian language side of the menu, I was able to discern what we might be eating, starting with herring with potato, smoked mackerel and “vareniki,” the Russian version of a pierogi. We ordered one stuffed with potato and another with meat. After Rick, Eugene, and Charlie made the mistake of asking Waiter Number Two a few questions about some of the items on the menu, his glare flustered them so much they ordered whatever blurted from their tongues; in this case it was chicken stroganoff, beef stroganoff and grilled chicken breast respectively. Zio, aware of the wrath of Waiter Number Two, wasted no time ordering the rabbit stew. One of the few things my Ukrainian-born Grandmother was able to cook competently was stuffed cabbage. It had been well over 30 years since I last tasted that stuffed cabbage, but it was a distinct taste and I was curious to see how this would compare, so my choice seemed easy. Under the pressure of the moment created by the gruff waiter, we didn’t realize until our main courses had arrived and that Gerry forgot to order one so, to the mix, and to Waiter Number Two’s rolling eyes, he quickly added stewed “Odessa” in a pot, a Russian variation on beef stew. For our beverage, we all ordered the local carbonated, non-alcoholic drink called Kvass. It was said, though I don’t know who said it, to be a very good chaser for vodka. To calm our nerves, we needed more than Kvass and this time Vlad gave us clearer directions to a liquor store. Gerry and I took a walk while the others waited for our food and drinks. The Russian-owned liquor store which shared a storefront with a video store had many Russian vodkas I was unfamiliar with. They were cheap and seemed like worthy companions to a Russian meal. But the store owner steered us away from the Russian stuff instead urging us to buy Absolut, proclaiming that it was much better. It was also much more expensive which might have been why he was pushing it. The Kvass and the herring and mackerel were waiting for us when we returned. The Kvass, like the cantaloupe drink at Ihawan, turned out to be another unfortunate beverage choice. Made with water, yeast, sugar and raisins, it tasted like a sweetened version of the malta drinks popular with Hispanics. I’ve washed down rum with coconut water, ginger beer, and a grapefruit soda called Ting, but chasing the Absolut with Kvass just wasn’t working for me. It did not, however, dampen mine or anyone else’s appetite once the food began piling on our table. The vareniki, freshly made and as light as something so dense could possibly be, still began to weigh us down. That didn’t mean there were any leftovers. Everything was scraped clean. Soon the clay pots, in which all the entrees were served, began to arrive. We slowly cleared through them, picking at the meats, scooping up the sauces, not leaving anything. The meats were tender, the sauces heavy and bland. The stuffed cabbage still had that distinctive taste but was better than I remembered it. 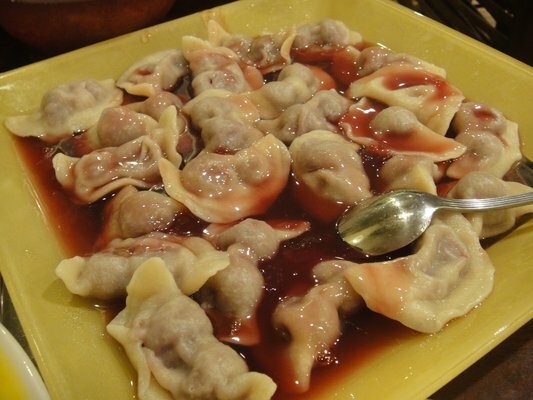 This was good hearty fare for a brisk night in the Ukraine. But it was summer in Coney Island and now our meal was weighing on us a bit uncomfortably. When Waiter Number Two came to take our dessert order we were hesitant. We made the mistake of asking what was on the dessert menu. He responded brusquely with “fancy cake and cherry vareniki.” We shrugged; we would try one of each for the table. Apparently he took that to mean we all wanted to try a piece of the “fancy cake,” so he returned with six pieces of a non-descript cream-filled cake along with a huge platter covered with 100 pieces of vareniki dripping with sour cherries and their syrup. To Zio’s failing eyes the platter looking like what he called “cherriolies,” or cherry ravioli. I tried a few but almost lost a front tooth when biting into the so-called pitted cherries. Despite the dessert oversight, and not factoring in the kvass or vodka, the meal came in just under $20 each. That was the good news. The not so good news was that it took the hour ride back, and then some, for the dead weight that had amassed in my belly after the feast at Café Gelchick to dissipate. It was dark when I got back. I turned on the lights in the kitchen. There were no bugs scurrying. The roaches were gone. And for that I was happy. I’ve never been back to Café Glechik, but from what I can tell it’s been a very good eight years. The restaurant, much bigger now has the prerequisite website; www.glechik.com. And on that website I noticed that scary word I see much too often at ethnic restaurants: “fusion.” In this case it’s called “Ukrainian Fusion,” whatever that might mean. In 2006 the New York Times reviewed the restaurant in the paper’s “$25 and Under” column. Anthony Bourdain featured it on his program “No Reservations” on the Travel Channel. You can, of course, follow Glechik on Twitter and Facebook. They even opened another Café Glechik; this one in Sheepshead Bay. There’s also a full bar at the restaurant now and I’m sure kvass is available. That funky beverage has prospered as well. Earlier this year, the Coca Cola company made a deal to import Kvass to the United States and a few weeks ago, at a nearby Whole Foods Store, I noticed that samples of the drink were being given out. A server smiled and asked if I wanted to try some. I politely passed. 40 years ago… Then again, it could have been the big red dog ! And I heard Ben & Jerry’s is even coming out with a Kvass ice-cream–Kvass and Cream! Seriously, in retrospect, I think the Vodka was the chaser for the Kvass. procuram há anos sobre esta questão e alargamento da ampliação do pénis.